So I’m making a few of my friends skirts for Christmas presents this year because they’re cheap and easy. I nearly finished my very best friend Anna’s and all I had to do was finish the seam between the band and the skirt. I’m going along with my zig zag stitch and it kept slipping from under the presser foot. I went to put it back under and I guess my foot slipped because I sewed right through my finger! I looked down and there was blood everywhere and half a needle in my left hand pointer finger, along with some thread that was still threaded through the machine as well. I was stuck. Of course, I was home all alone and of course both my phone and the scissors were on the floor, out of my reach. I cried out for help several times, knowing it was useless. 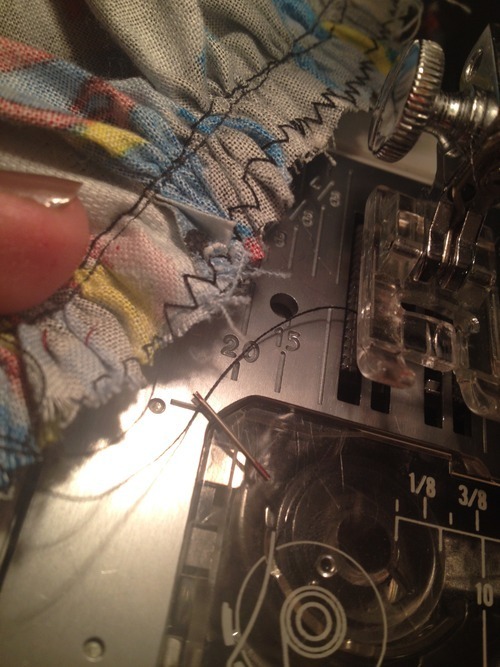 I was shaking so bad, but eventually I was able to loosen the thread enough to cut it with the little razor hidden on the side of my machine just for cutting thread and free myself. As soon as I did that, I was able to pull the half of the needle in me right out and of course there was more blood. 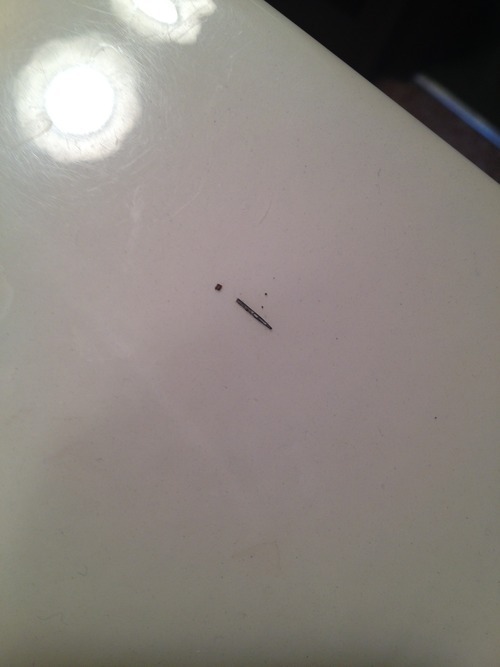 I started sucking on my wound and lunged for my phone when I realized there was still thread coming out of me. I had sewn an entire stitch into my finger! I called Aaron absolutely sobbing and he only caught half of what I was saying but he left work and rushed to be with me. While I was waiting for him, I contemplated calling 911, but after I examined it further and deduced that I didn’t hit bone and that the gash wasn’t that deep, I determined an overpriced ambulance ride was not worth it. Also, I hate hospitals and emergency rooms and spending an undetermined amount of time there just for a doctor to xray me and look at me and say “You’ll be fine” was not what I wanted to do. But that damn thread was still in there! I pulled and pulled, but it only made the wound bigger. I went up to my room to examine the scene. A nice blood spot on Anna’s now ruined skirt, blood on the presser foot and gasp! The part of the needle that I pulled out was missing the tip! Gross. I’m pretty sure it’s in my finger. Once Aaron got home, I was able to get most of the thread out. I’m pretty sure the rest of it is still attached to the tiny tip of the needle that’s in there somewhere. I think I will be okay leaving it there though. My tetnis shot is up to date. The bleeding stopped and I put a bandage on it. Now it just hurts when you touch it. Very tender and VERY sore. and now I only have 9 functioning fingers for a few days. I will now be much more careful when I sew! 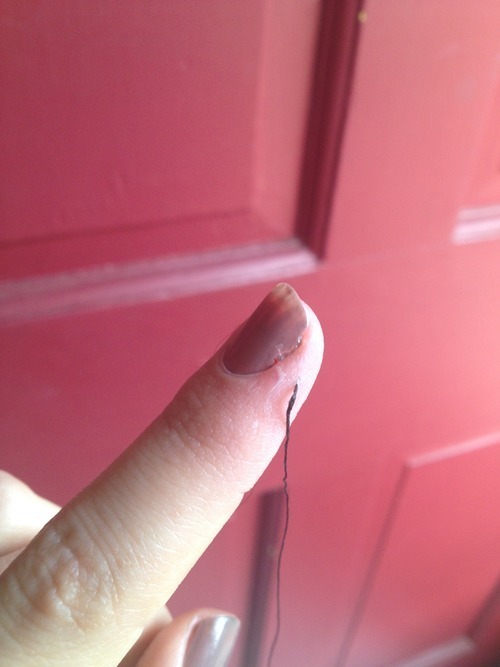 You can see at the top right next to my nail where the needle went in. and there’s that lovely piece of thread sticking out! There’s the loverly needle that was in me! Blood on all the things! I am lucky that It didn’t hit bone and I’m lucky that the needle didn’t break and hit me in the face/eye. Be careful out there my fellow crafters! UPDATE: the tip of the needle did not fly into the oblivion of my room as I had previously hoped. It was indeed, still in my finger. That thread in my finger sticking out? Yeah the needle was still attached. That’s why it hurt so much to pull on it. It wiggled its way out on January 1, nearly 6 weeks later. I am lucky I didn’t get an infection.